It’s been a true privilege to hear, converse with, and video-record the inventive and durable saxophonist Joel Press for the last five years (and since I met Michael Kanan through Joel, it has been a double blessing). Of course, the person behind all of this was the irreplaceable Robert D. Rusch of CADENCE, a true benefactor. Joel was most recently playing a gig in New York City on July 3, 2016, at Smalls — with a quartet of Michael, piano; Lee Hudson, string bass; Fukushi Tanaka, drums. Here are five evocative performances from that evening: GONE WITH THE WIND, SOFTLY AS IN A MORNING SUNRISE, FOOLIN’ MYSELF, NOSTALGIA, and YOU DO SOMETHING TO ME. And — by popular demand — four more delights: BLUES, WHAT IS THIS THING CALLED LOVE?. BODY AND SOUL, IT’S YOU OR NO ONE. Please note that every note has substance and emotional meaning, and the quartet makes even the most familiar line or standard seem lively and poignant. Thank you, Joel, Michael, Lee, Fukushi, and Smalls. We are in your debt. I was moved and delighted by Joel’s easy yet searching approach to melody and swing: new and yet affectionately connected to the great traditions. To explore Joel’s many worlds, one place to start would be here. A decade later, more or less, we found ourselves in friendly proximity: Joel on the bandstand at Smalls, me with a video camera as close as I could get without posing a fire hazard. The other members of this compact inventive ensemble are Michael Kanan, piano; Lee Hudson, string bass; Fukushi Tainaka, drums. Here’s a still photograph of that world, taken for us by Chihiro Tainaka, with the back of my head accurately and mercilessly rendered for posterity. Two seats to my left is the warm and thoughtful Maya Press, beaming love at her father. But you can’t play a picture, any more than you can eat the recipe. So — with Joel’s approval — I present five performances from that night at Smalls, with some more to follow. His soft tone, love of melody, and caressing swing are still gloriously intact, and his colleagues on the bandstand are the most subtly intuitive conversationalists one could want. I wanted to call this blogpost PRESS ONE FOR SWING. Now you know why. More to come. When I heard that Joel Press, tenor saxophone; Michael Kanan, piano; Neal Miner, string bass, were going to be playing a late-evening session at one of the two jazz shrines of West Tenth Street, Mezzrow, I got down there early to soak it all in — poems in music from three great lyrical poets. Here are some highlights of the first part of the evening. Joel, Michael, and Neal tell us, without words, that melody matters, that the old songs are memorable, and that one can sing beautifully through one’s instrument in a community of friends. Joel has absorbed the whole tradition of jazz but stays current, exploring worlds while swinging, always sounding like himself. Michael and Neal are the best guides to the opened universe of sounds that I know. When I heard that Joel Press, tenor saxophone; Michael Kanan, piano; Neal Miner, string bass, were going to be playing a late-evening session at one of the two jazz shrines of West Tenth Street, Mezzrow, I got down there early to soak it all in — poems in music from three great lyrical poets. Here are some highlights, and I do not use that word lightly. Another assortment of beauties to come in the near future. The hymn BRIGHTEN THE CORNER WHERE YOU ARE speaks to our responsibility to do good, to be loving — at a moment’s notice — no matter how secular the surroundings. Mezzrow, seen through the constricting lens of my camera, might be dark, but the music is touchingly bright. Pianist Michael Kanan is one of my heroes, someone whose musical and aesthetic instincts I trust without question. I met him through the most respected saxophonist Joel Press, and once I’d heard Michael play a chorus I knew I was in the presence of a deep yet light-hearted sensibility. He can be eloquent and touching but he never sells emotion to an audience in capital letters; he is witty but never comedic, and he has perfect taste without being fussy. Michael also is a splendid compass needle pointing to the finest players and singers. So when I read some time back that Michael was leading a session at Mezzrow, I sent in my money and was there about ninety minutes before it began (listening to the splendid guitarist John Merrill) to be sure I’d get to sit in the proper place. It was an astonishing evening at Mezzrow, but so far I’ve had no other kind there. I’ll be back there for sure on April 14th to hear Barbara Rosene and Ehud Asherie — another special night to come. And I promise you more performances from the exalted Kanan – Miner – Ruggiero ensemble. 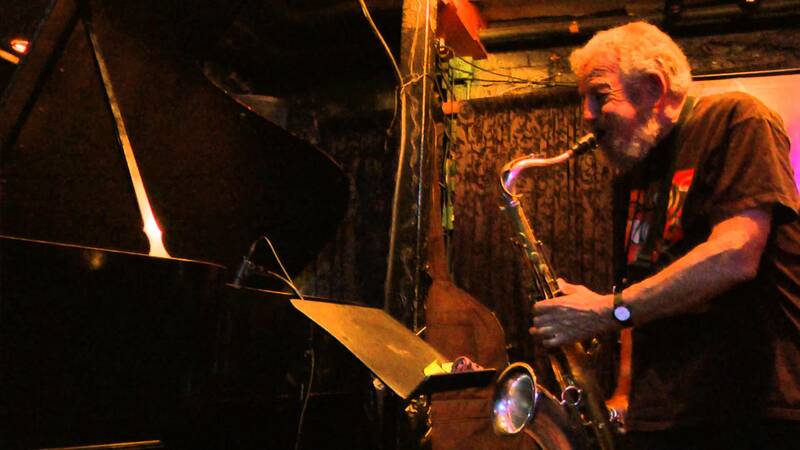 The masterful Joel Press created a wonderful musical evening at Smalls (183 West Tenth Street) at the end of my 2013 stay in New York City — a first portion posted here. Joel had Michael Kanan, piano; Boots Maleson, string bass; Fukushi Tainaka, drums, along for some soulful melodic explorations, which bow to Masters Lester and Thelonious along the way. Music to warm the heart and melt the snows.